Ok so I said I was having a break from the old blog but I was doing a bit of the old self analysis on the way home (as you do) and I came to the conclusion that actually I am a little bit bossy at times. Then I wondered how people really perceive bossy? And actually personally, I think bossiness gets a bit of a bad rep.
You see being bossy and opinionated go hand in hand really. I think it’s hard to be one without the other. I think being confident with your opinion if you think it’s valid is important. But there are times when you need to be passive as being opinionated 24-7 is overbearing. If you’re passive all of the time though and afraid to speak your mind you run the risk of being walked over and people might not consult you in the future about things because they think you don’t care about anything. I do admire strong people and those who speak their mind but I suppose we can sometimes clash a bit. 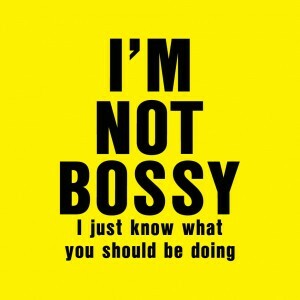 I can be bossy but I see it more as being in control or in charge of a situation that I feel I’m best to deal with. Perhaps this comes from being a working mum and raising my girls. It’s hard to escape mum mode after all. Anyway the point is you can’t win. People will dislike you for being meek or for being controlling so just be who you are. Cancer taught me that speaking up is not as scary as worrying about death so I guess in a weird way I’m lucky I had the experience to compare everything to.